Harold stands with his favourite gun, the Akari Custom 2011 9MM in front his trophy case. Between his security company business and spending time with his family, Harold Edgar Hopkinson, popularly known as ‘Voltage’, still finds time for motor racing and his favourite pastime, hand gun shooting. Harold, 63, mostly wore a satisfactory grin as he recalled the fond childhood and early adult life memories when he sat down with Kaieteur News. He was not always known as Harold Hopkinson, the fourth child born to Herman and Beryl Bourne. In his formative years, he was Michael Bourne, the adventurous child, residing in a wooden colonial-style cottage house at 77 Light and Albert Streets with siblings Joan, Herman, Jacqueline and Terry (deceased). It wasn’t until he had to produce his birth certificate for Common Entrance that he realised that his mom had registered him under her name. “She did not put anything else on the form, so I grew up as Michael Bourne. All through school everyone called me ‘Mikey’ or ‘Bourney’. Once I found out, I hated Harold. I eventually did a deed poll to show that I was also called Michael Bourne,” Harold stated. He is married to Roxana, a former Human Resources Manager for Banks DIH. Harold has fathered seven children including: Michael, Malvin, Marcel, Chuck, Quincy, Tracey and Denzil. He has adopted the same approach his parents used with his siblings. “I am not forcing any one of the kids to do something they don’t want to do. My father had some parables that I lived by up to today. Friends come and go, but enemies accumulate. You never had to remember the truth…Don’t lend money that you cannot afford to lose. Life is a one lap race. Live it to the fullest. These still live with me,” Harold shared. Harold has a bullet wound to his leg that he keeps pressing on because of the fearless spirit that he embodies. He spent most of his time building go-carts, enacting cowboy characters and reading comic books. Life then was above average financially because his father was a boatswain on a ship that took bauxite from Guyana and brought back crude oil. “It was not a gold spoon life, but far above average. When there were the disturbances in the 60s, we fed many people because my dad brought stuff back with him. He gave neighbours and helped many people at the time,” Harold stated. Harold admitted to being ‘a vicious kid’ in the sense that he was always ready to fight, and fight he did. At his primary school, St. Ambrose Primary, he led a group of boys into an elaborate scheme to extort money from other children until one day they were caught and flogged by the headmaster at the time. “Everybody got six lashes, but when I told the whole school that he is the candidate for the gallows, he dropped 13 lashes on me,” Harold recalled. He met his former head teacher a few years ago, and although partially blind, he immediately remembered Harold when he heard the words, ‘you are a candidate for the gallows’. Harold is still searching for one of his teachers to present him with a BMW car in appreciation for the positive role played in his life. When he wasn’t fighting, Harold was busy experimenting, making wooden products. His creations landed him on the front page of the Chronicle, which featured his wooden airplanes. He attended the Guyana Oriental College in Thomas Street, which was at the time headed by Shurti Khan and included teachers like the former Acting Chancellor of the Judiciary, Ian Chang. Harold then attended the Tutorial High School, admitting that he got ‘away with murder’ because of his athletic prowess. He recalled his algebra teacher’s motorbike being mysteriously blown up. 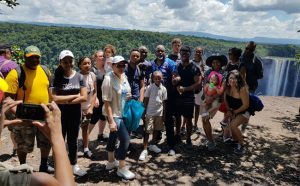 However, Harold noted that it was the guidance of teachers such as Goodluck, Bruche, Dillion, Mother Dey and Lancelot Baptiste who helped to instill discipline in the children. By the time Harold got to the upper classes, he was bored. After all, he was already earning cash, employing several other children by making afro combs, belt buckles and pendants to be sold at the Bookers store chain. His inner drive to be different and not follow the crowd, led him away from the traditional careers of banking, lawyer and medical doctor. Harold enrolled at the Government Technical Institute (GTI) to pursue a career as a radio technician and electrician. This was because one night he was listening to his favourite children’s programme when the radio fell. “I was devastated because I really liked to listen to ‘Chittero’ Kid. I told my dad right there and then that I got to learn to repair the radio. I told my dad don’t worry with university, I wanted to go over to GTI. I was never a follower. I guess it was a form of indiscipline,” Harold stated. At 19, Harold was ready to enter the work force equipped with the certification acquired from GTI. He then earned a job at the then Guyana Airways Corporation. He said, the company made a mistake and placed him in the ground-handling department. “I remember it clearly. Terrance King sent me to deal with a bucket of s**t. I was crying outside the aircraft wondering if that is all I studied for,” Harold stated. Luckily, about a month later, the company realised that they made a mistake and wanted to relocate him to another department. However, Harold wanted to stay, having grown fond of the conversations that the older male co-workers shared. Eventually, Harold who described himself then as ‘a little big head boy with glasses and afro’ became the station manager for British Overseas Airways Corporation at Timehri. At 19, Harold was practising his knife throwing skills in an office at the airport when someone burst into the room asking for ‘Voltage’. “It was Evarad Burnham and he said from next week you working for me in the Avionic Department over at Guyana Airwaves,” Harold recalled. He was responsible for building the wiring harnesses and testing all the avionic for the fleet, including the Twin Otters, C-47s, Cessna 310s and with the assistance of Clarence Afoo, the Beach Craft Super King Air, which was used by the late President Forbes Sampson Burnham. In those days, it took three hours for Harold to get to work due to poor roads linking Georgetown with Timehri. According to Harold, during that time something happened and President Burnham required all those working on the planes to enter the Officers Cadet Corps of the Guyana Defence Force (GDF). “I never thought I would go in the army and shave off my beard, but Burnham was very manipulative. He made us think of him as a black Jim Jones with his twisted way of thinking. I don’t like history because it influences modern people to rehash the past to reinvent the wheel,” Harold stated. 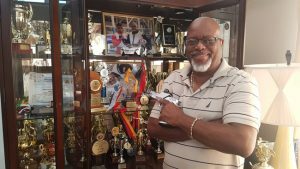 Harold’s electronic skills was useful when Guyana televised the first boxing match organised by Dem Guys Promotion for the 1980 title bout between Guyanese Patrick Ford and Mexican Alvarez Sanchez in Las Vegas. According to Harold, Burnham was adamant that the fight must be televised for a large audience at the National Park. He said he assembled a team. They ran a cable from earth station, next to the park for the video link using an NTSC system although the rest of South America uses the PAL system. Projectors were modified and two large screens erected. The sound was secured through a telephone link via Barbados. “The President was an ardent boxing fan. I remember Burnham in a white outfit, sitting smoking a cigar and watching the fight …We made it happen and everyone watched it in glorious black and white. It was delayed by about two seconds, but they didn’t mind. Everybody thought Ford had won, but he lost by a split decision. Nonetheless, they got to see our guy fight,” Harold stated. Unfortunately, circumstances forced Harold to leave for the United States a short while after the fight. He returned to Guyana in 1985 and worked alongside Neil Chan of Mashramani fame. He assisted with procurement and was the sound engineer of the band through Solo Sounds International. He went back fully into electronics when in the late 80s he became the head of engineering at Guyana Television Broadcasting Company (GTV), now the National Communications Network (NCN). He worked alongside, Enrico Woolford, who was the General Manager at the time. “That place was a mess,” Harold recalled. In 1991, Harold accepted a Government scholarship to study in Japan where he earned a degree in television broadcasting and journalism. By the time he returned to GTV, he had learnt Japanese. Shortly after, Harold ventured into cricket broadcasting, working alongside Simon Wheeler and Johnathan Riley. “We invented cricket with the playback. This was a massive operation in the 90s. We are talking about setting up 20 to 30 cameras around the ground. Machines had to be set up; we had pre-arranged lines, advertising and logistics for about 40 support crew,” Harold said. Up until 2000, Harold loved televised cricket, travelling around the West Indies until he got fed up of watching West Indies lose. “When they were winning, it was fun and then they started to lose. I was bored and tired. It wasn’t fun anymore and so I just quit. I walked away from it all,” Harold stated. When he returned home, the late President, Janet Jagan, requested his service at the then Guyana Airways 2000 as head of security and communications. He was sent to Miami where he received a diploma in airport security and was certified in aviation security. At the airport, Harold recalled playing an integral role in the crackdown against ‘backtrack runnings’, working closely with the current Director of Public Prosecution (DPP), Shalimar Ali Hack, who was at the time the Deputy DPP. “It was good in the sense that we stopped the backtracking. We never lost a case to be exact. We are talking about hundreds of Guyanese people. I got two commendations from the United States Department of Justice,” Harold stated. When the airline closed, Harold joined MMC security aviation division, which was contracted by Neal and Massy to provide services for British West Indian Airways. He said it was one of his saddest days when MMC was ‘kicked out’. Subsequently, British West Indian Airways reached out to him and requested that he assemble a team to provide security services at Timehri. He formed Top Gun Aviation Security Services and got satisfaction when he replaced Massy. His company also provided services for Air Transat, Zoom Airlines, Red Jet and North American Airlines. Harold has been certified by the United States Diplomatic Security Service and was part of the security detail for Former United States President Jimmy Carter when he visited Guyana in 2015. He is a revered marksman with the handgun and was instrumental in providing training to the PRG Quick Reaction Group, known as the ‘black clothes squad’. Following the 9/11 bombing, Harold decided to change his company’s name to Secure Innovations and concepts Inc.
“One of my special skills is in document fraud and interview techniques to see if they bad and good. I am profiler,” Harold pointed out. 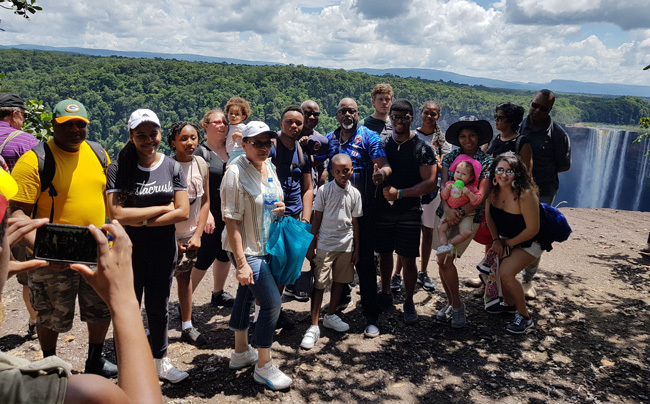 Harold, his wife, children and other relatives on a getaway trip to Kaieteur Falls. Harold is a race car driver too. Although he started racing in the 1970s, he got great pointers while at GTV from the company’s then Board Chairman, Kit Nascimento. He started racing a Saab 91EM. His first car was a Honda CRX, which he built by himself. He also owned a 240 ZX. Harold raced in Jamaica twice under the Guyana flag for the Guyana Motor Racing and Sports Club (GMR&SC). 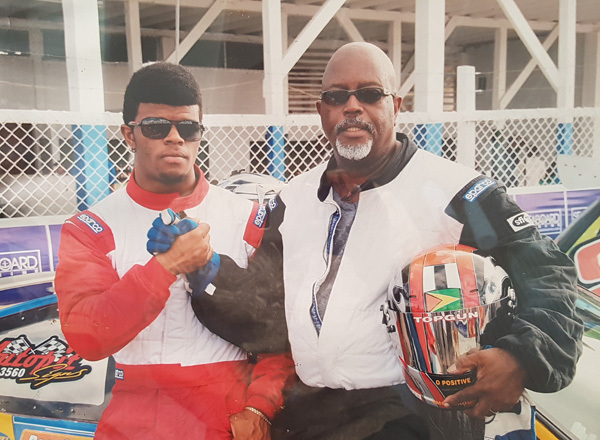 He boast of never losing an endurance race locally with his son Denzil ‘Lewis Hamilton’ Hopkinson. He is reluctant to race these days because the sport has become too commercialised. “It turned into a money game. Who got money, not necessary skills and it has turned into a demolition derby. That’s why we have not raced in almost two years. He is not fair that because I got more money I going to put in the performance parts and race,” Harold stated. His son who races under the slogan, ‘Hammer Time’ is big fan of Formula 1 Driver, Lewis Hamilton. Denzil was around 17, when he started driving the racecar on his own following some lessons from his father. “The first time he got in the car, he went around the track jerking the car, but by the time he got on the back straight he was changing gears. The guys asked me “who was in the car? I told them, “that is my son!” He has been racing ever since,” Harold said. 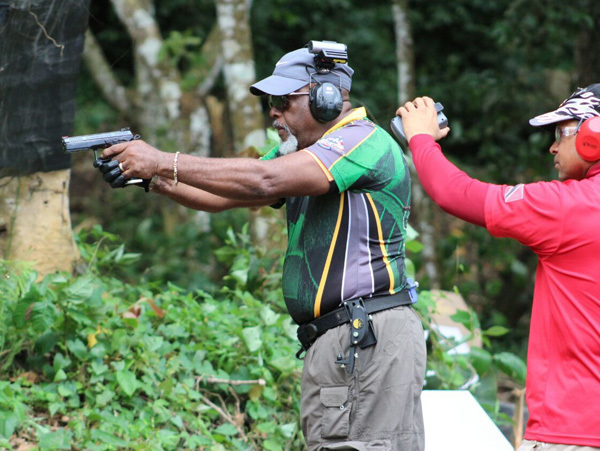 Harold is a past hand gun captain for Guyana. He has won the National Hand Gun championships in Guyana. He has represented Guyana at gun courses across the Caribbean and has won over two dozen trophies and medals all with one hand – the left – as the right has a severe injury. “It never bothered me. I started to beat able body men with two hands. I want to reach master class and so I am going to repair my hand very soon,” Harold vows. Harold continues to forge ahead with his security company and is always looking for honest persons to work for his clients including the aviation sector. His advice to young people is never follow the crowd as they will lead them astray. “I want the Guyanese populace to stop operating like mendicants. Work for what you want. Set your goals and work towards it,” Harold stated. As he recaps his life, Harold is reminded of the benchmarks his dad said will make him a successful person in life. “He said all you need is a good gun, a watch and a good woman and you are good to go,” Harold said.